So happy to be at the Oregon Coast!! Last week we were so lucky to get the time to go to the Oregon Coast with Brandon's whole family! We usually try and go every year as a little family but we hadn't been in 2 years and it had been way too long since we had gone with his family. The kiddos were so crazy excited to fly on a plane and to spend a whole week with their Grandpa and Grandma and cousins! I was a little nervous to fly with Parker because sitting isn't his favorite thing and in a small confined area...a little scary! But over all I was quite impressed he did great! :) Only a little bit of crying toward the end of the flight. We always stay in the same quaint little town called Cannon Beach. It's so picture perfect! I love it. We all stayed in the huge GORGEOUS beach house. It was seriously amazing we could walk right onto the beach and the view from the deck was breath taking. We spent every day just hanging out, playing on the beach, talking, eating yummy food (Doogers Clam Chowder...the best EVER) and playing games. Brooklyn didn't really remember the ocean and the beach and Parker had never seen the ocean so we were so excited to spend time playing in the sand and putting our feet in the ocean. Parker loved having the waved chase him, he would get really close then wait for the tide to come back to him then run saying, "It's coming it's coming!" He also loved playing in the sand although it was mostly messing up sister's castles but hey what are brothers for, right?! Brooklyn and Ashlyn loved the sand and taking walks on the beach. Ash was so thrilled to play with Jonah and Aidan for the whole week I swear they played so much I barely feel like I saw them! :) Brooklyn loved on Audrey, she was like a big sister, she would play with her and help her in any way she could. It was really sweet to see her love Audrey so much! We can't forget the trip to church on Sunday. Me I usually over pack but I forgot our church clothes so for the first time in my life I wore pants to church! Yep I learned my lesson, always bring at least one skirt just in case! :) We actually made a family record the morning before church too. Brandon and I got us and the 3 kiddos ready in 30 min...yes that was right 30 min!! That has never been done before either. I was quite surprised. I am really glad we went even if I was in the hall with Parker half the time. It's always such a testimony to me that the church is true and it is where ever we are! I love having that reassurance! We took the kids to see the sea lions at the aquarium. Parker loved touching the star fish and anemones. We walked around at the little shops and can't forget the yummy ice cream at The Picnic Basket. We all had so much fun! The Oregon Coast was a blast I am so thankful to have such a wonderful extended family that I feel so close to. It has been a while since we had gone to Boise to visit family and were able to just hang out! So Brandon and I decided that's exactly what we would do! It was a blast Brandon went to the BYU vs. BSU football game with his dad, we ate lots of yummy food, hung out with the families, went bowling, and to Carson's birthday party! I can't believe we fit it all in but we did and it was so much fun! The kids really liked being able to just play with their cousins and Lexi...it had been a long time! I am so glad we decided to go! Daddy and the kids tubing for the first time! Ashlyn was so excited to try tubbing! Why it took us all summer to go out and go boating...I don't know! But it was so much fun! We went with Thuesons and just had so much fun! The kiddos had really never been boating so it was really fun to see them try new things. Ashlyn, Brooklyn, and Parker tried tubing for the first time and totally loved it! I was able to wake board, it had been quite some time!! :) And Brandon, Tad, and Kristen did some big kid tubing I thought they were going to get hurt but no one did I was quite surprised! Brandon did a crazy hang on and pulled himself back up (not sure how he did that), Tad did get thrown off on a crazy wild turn and Kristen just sat pretty in the middle like it was no big deal! :) Loved it! We had a blast! Thanks Thuesons for inviting us! We were able to go and take a tour through the Brigham City temple before it was dedicated. I hadn't been through a temple before it was dedicated and the kids hadn't either so I was really excited that we got to go. Even though it was a long car ride it was totally worth it. The girls loved all the pretty chandeliers in the rooms and thought it was so beautiful! After the tour we were talking about the temple and I asked what their favorite part or room was and I should have known asking the question but their responses were so perfect for their personalities! Ashlyn said "I loved the baptism room I can't wait to get baptized!" And Brooklyn said, "I love the cookie room!" Of course she would love the parking garage treats as you leave :) Oh I love the things my kiddos say! All in all it was such a great learning experience for the kids to go in and see a temple! Brooklyn had her fist day of preschool it's kind of a big deal she seems so little to go! Shes in Mrs. "Micole" Preschool and she lives in our neighborhood which is just great. She has her cute little friends Abby, Boston, Emmy, and Joselyn in her class she already knows! It's such a big change for me this year, I have Ashlyn in school all day and now Brooklyn off to preschool 3 mornings a week for a couple hours. So it's just me and Parker alone. Which its really weird a whole new phase of motherhood for me. I feel kinda old :) It has been so great for Brooklyn's confidence to go to preschool all by herself! She is gaining her independence. I just love watching her beam with her huge smile on every time I pick her up from school. It's darling to see her so proud of herself. Parker is 2!! I can't believe how fast time has gone! He is talking so much lately and is such an energetic little boy. I love every ounce of this boy! I just love every morning hearing "Momma!" It's the prefect way to start my day. Then when I go into his room he has the cheesiest smile on his face and is so happy to see me I just love it! Then we snuggle for a little bit watching his favorite cartoon Mickey Mouse Clubhouse. He thinks Goofy is quite funny! We have some good laughs. :) Then his day is off to playing cars, throwing balls, riding bikes, or playing with his sisters. He is such a fun boy. One of my many favorite things he does is when he walks away from you he will turn back and look at you, click his mouth, and try to snap point at you. He's such a little flirt! I have been working with him on saying I'm 2 but he will not say 2 he will say "I'm 3 or I'm 4!" :) His favorite foods are grapes, hot dogs, string cheese, and "cicles" otter pops. He says everything and is saying tons of sentences. I love when he comes into the room each time he has to say "Hi Mom!" so I get to hear him say hi to me a lot throughout the day! When I lay him down for bed at night he gives me the biggest hug and kiss and says "wuv you momma!" as I leave the room. I just couldn't ask for a sweeter little boy! Another thing he does is that he is pretty awesome at his scooter, we live on a little hill, and as he goes down he either puts one leg up behind him and balances or will put both feet on the scooter and try and jump the scooter! It's pretty awesome. He is still very left handed and weighs 32 pounds...our future quarter back! Couldn't be happier about his own Cars bike! He is in love with Cars! We watch "Aqueen" just about everyday! So we had to do a Cars birthday party for him. Luckily it worked out that we would be in Boise the weekend of his birthday so we got the family all together for a Cars party at the park. He got a riding Macqueen car he loves, a cars bike, cars coloring book, cars toys, and an awesome tee ball tee and baseball bat. He had a blast playing with all his cousins and with his fun new things. I am so thankful for this sweet little boy I get to play with each day! Happy Birthday Parker Boy! This is August 24th, 2011 on his 1 year birthday! I can't believe how much he has changed! One handsome little boy! Announcing Mr. and Mrs. Harvey! I am so excited for my sister Aubrey! 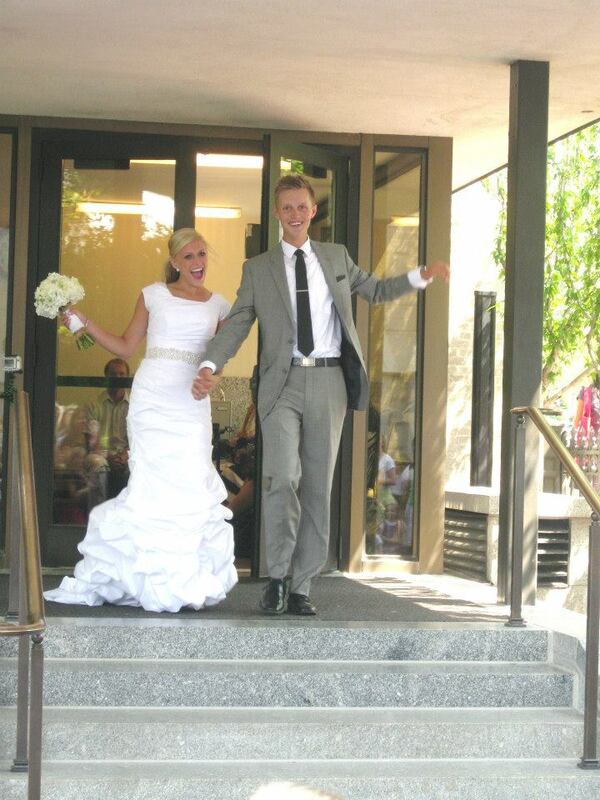 Her wedding was beautiful and it was so great to have all the family at the temple to see her on her wedding day! It really was a beautiful day! I am so grateful shes my sister and friend! I am also thankful she found Kyle and they fit so well together they are so much a like...it might be kinda scary. As I watched them in the temple while they were getting sealed and then throughout the day I could see how much love they had for one another. I made me happy to see her just beaming with joy and happiness! 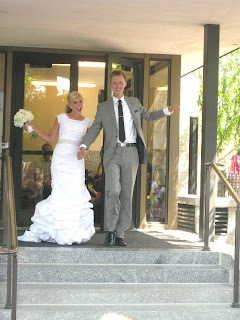 A lot of work went into the receptions both in Utah and in Boise and they both turned out wonderful. I just love seeing how things pull together and they turned out perfect! :) Congratulations on such a darling couple Aubrey and Kyle! I am so happy for you! Yes we are addicts! We just couldn't resist we had to go check out Cars Land! And it was amazing! We actually literally decided to go on our way home from church. So we packed up and headed out...it took us only like 2 hours to get home, eat lunch, pack, and load up the car and we were off. We always stay in Las Vegas just to break up the driving. Then Monday we woke up early and drove into Disneyland at about 12 for a few days a Disney fun. We spent most of the first day in California Adventure checking out the amazing Cars Land! It was awesome. The rides were a blast Parker was freaking out (in a good way) with "Aqeen" (Macqueen) and Mater seeing them all over!! He was thrilled and loved all the rides. :) The girls of course had a blast we ate at out secret spots and had so much great family fun time. Brooklyn brought her Little Mermaid dress just to ride the Little Mermaid ride with Brandon because she thinks she's Ariel and Brandon's Prince Eric! 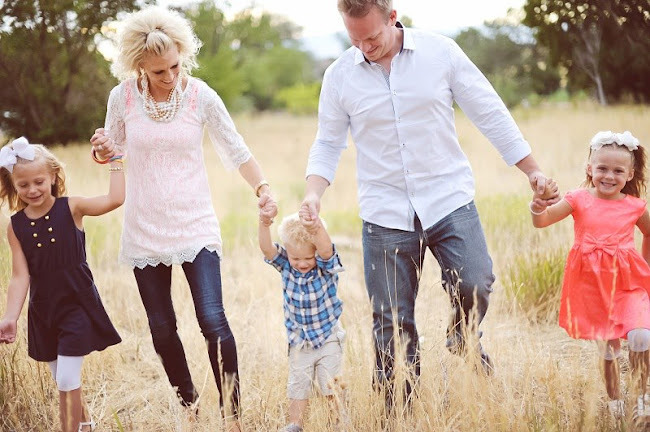 It's just darling It was exactly what our family needed since we have had such a crazy summer. We spent the whole time just letting the kiddos run the show, its the best way to do it! I don't know why we are so addicted to this place but each time we go we have so much fun and make so many memories we will always remember! We LOVE Disneyland! Happiest place on Earth! I love this picture...just holding hands walking through Cars Land for the first time! We went with some of our friends to the Strawberry Days Rodeo and it was too much fun!! The kiddos loved seeing all the animals and the yummy strawberries to eat! Parker would say all the animal sounds as he would see them it was so cute. I don't think I've seen him sit that still, ever. I think we may have to do this every year :) And Brooklyn had to wear her cowgirl hat! The kiddos just loved watching everything and hanging with their friends! Even though Brandon was sick we still have so much fun! Yee Haw! Love this girl! I am so glad shes my sista! All ready for he shower! Oh this little boy! He is just a ball full of energy!! I love him to pieces but the things he can do in a days time is quite amazing. I thought I needed to blog this so I can look back and laugh! :) He starts his day off with a whirlwind as I was getting ready he found a blue marker and drew all over himself and the couch! While I was giving him a time out I left the bathroom for just literally a second and he climbed onto the counter, plugged the sink, and just about over flowed the sink while he was sitting in the sink! Not excited about his time out! Thank goodness for his nap time I would not know what I would do without it! He is so sweet and clam as he sleeps :) Well then he woke up and thought that jumping off the couch was a good idea...he ended up hitting the shelf on the wall above the couch and knocking over out big temple picture luckily it flipped over his head so when it shattered all the glass missed him! So I had him go play with the girls the girls then thought it would be funny to have him put gumballs and whoppers down his diaper. He thought this was hilarious and ran around with his diaper full of candy for quite some time. He has to sleep with both his Mickey's, so cute! His face, "What Mom?! I don't have anything in my diaper!" Parker loves to have to chase him to get dressed so I was able to get his pajama shirt on but in the middle of changing his diaper he took off and I found him half naked watching himself pee down our stairs! He was so proud of himself! I couldn't help but laugh. This little boy sure keeps me on my toes! I love every minuet of his craziness :) Having a boy is so different but oh so much fun!